The British Lop is a west country breed which originated around the Tavistock area either side of the Cornwall/Devon borders. For most of its history from the early years of the twentieth century, it remained a local breed undiscovered by farmers outside its native territory. It suited the locality well and was in strong demand there so there was little incentive for breeders to go shouting its merits beyond the far south west. In those days it was registered and known as the National Long White Lop Eared breed – certainly descriptive if not very snappy. In the 1960s, the name was changed to today’s British Lop. When the Rare Breeds Survival Trust (RBST) was established in 1973, the Lop was listed as one of the six rare pig breeds recognised by them. The inclusion of a breed as officially listed as ‘rare’ generally increased interest in all such breeds and indeed the Lop is more populous now than at any time in the last 30-odd years. 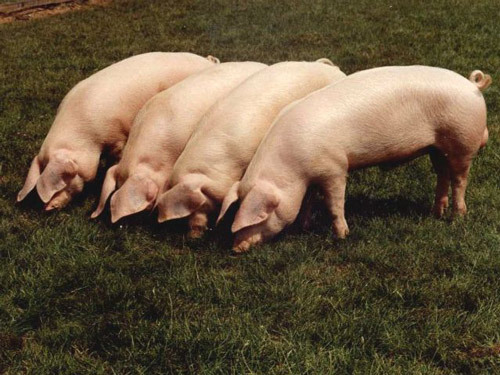 However, it suffered, in comparison with the other rare breeds of swine, by not looking particularly distinctive. It is, after all, as its earlier name says, a white lop-eared pig and to the non-specialist, could be confused with the Welsh or the Landrace. Instead, enthusiasts flocked to pigs with short snouts, spotted or ginger hogs but not so readily to the pig that looked quite normal. Yet the Lop has a great deal going for it. It is generally docile and easy to manage and is hardy enough for outdoor systems. It grows readily and will finish with a well-muscled, lean carcase at pork or bacon weights. The dams are prolific and make good milky mothers.